“La Garance” is an idylic stone villa set in the Provencal countryside, 6 kilometers from the village of Gordes. The house is named after the plant that grows wild in the garden amongst olive and almond trees, lavender, rosemary, roses and oleanders. The interior of the house is spacious, comfortable and bright. It is furnished with a mix of antiques and contemporary furniture and artwork. There is an ample living room with stone fireplace; a fully equipped kitchen; a dining area adjoining the kitchen; 3 bedrooms, 2 ½ bathrooms and a utility room. The terrace and outdoor pool feature lovely views of the Luberon. We have rented this wonderful house successfully via VRBO and through word of mouth for nearly 20 years! We guarantee that you will fall in love with this special place, just as we have and just as dozens of visitors have over the years. Discounts are available for longer stays and off-season dates. Please ask! The main areas of the house are all built on one level and have an open plan ideal for family holidays and for entertaining. There is a fully equipped kitchen and dining area with a bar (stools for 4 people), dining room table (can seat up to 8), and French doors that open onto the shaded terrace, which is built on the south side of the house and sheltered from the famous Mistral wind. The large living room is connected to the entrance vestibule and kitchen and also has French doors leading out to the terrace. There is a functioning, wood-burning stone fireplace that serves as the focal point of the main seating area. The master bedroom adjoins the living room and is at the far end of the house. It has a queen size bed, an en-suite bathroom (bath with shower, bidet), a walk-in closet/dressing room and an antique stove and desk. It also has French doors that open onto the terrace. At the other end of the house there is a full bathroom (bath with shower), a powder room, and two more bedrooms. The larger of these has two twin beds, a desk, and a dresser, and French doors with steps leading to the garden and pool. The smaller bedroom has one twin bed and a comfortable trundle bed. There is also a well-equipped utility room with washer and drier. The house comfortably sleeps six people. As mentioned above, the living room, dining room, and master bedroom each have French doors that open onto a lovely flagstone terrace which is one of the delights of the house. The terrace is shaded by a mature Mulberry tree and is the perfect place to relax and enjoy meals in hot summer weather (or even on warm days during the winter!). There are many local markets nearby and our kitchen is fully equipped for people who love to cook. Lots of cookbooks in English and French too! Of course, during the hotter months guests can relax while enjoying the private swimming pool in the garden and its spectacular view of the valley and the Luberon mountain. We generally open the pool from mid-May to mid-September, weather permitting. This is a family home and throughout the house there are many bookcases filled with English and French language art books, novels, children’s books, cookbooks, and a wide selection of guidebooks. We know the area intimately and we are happy to give advice of all kinds for things to see and do. The appliances include a mixed electric/gas burner stove-top; built in oven; dishwasher; refrigerator with separate freezer compartment; microwave oven; washing machine and dryer; two hot water tanks; hair dryers; a CD player; Satellite TV with DVD player; DSL and WiFi. Bed linens and towels, including pool towels, are provided. Most of the windows have screens. Our "gardienne," who we adore, will prepare the house for your arrival and comes once a week to clean. There is a renter’s manual with all the information you might need about the house and a guestbook in which previous tenants have left information and recommendations for restaurants and activities in the area. The entire house and 3-acre garden, with 17 olive trees, is exclusively accessible to guests. Privacy guaranteed. There are two steps up from the parking area at the entrance to the main door, but otherwise the house is wheelchair accessible. “La Garance” is the ideal place to relax but it is also perfect as a base from which to explore the amazingly rich Luberon region, with its charming perched villages, quaint country markets, spectacular landscapes, and innumerable historic castles, churches and museums. At any time of year you can enjoy short drives through fruit orchards and vineyards to the perched villages nearby – world-famous Gordes and the Village des Bories (5 mins away), Menebres, Roussillion with its ochre mines, Lacoste and the chateau of the Marquis de Sade, Oppède and its extensive hilltop ruins, and the winding laneways of Bonnieux (each about 15mins away). The larger historic cities of Avignon, Arles, Aix-en-Provence, and Marseille are each about an hour away and make for easy day trips. In the summer there are major theatre, opera, music and photography festivals in Avignon, Orange, Aix en Provence and Arles as well as numerous local events. L’Isle sur la Sorgue (20 minutes away) is a major centre for antiques and has a renowned Sunday market (get there early to avoid the crowds!). For those particularly interested in wine, Châteauneuf du Pape and other Côtes du Rhone wine growing areas, such as Gigondas and Vacqueyras, are an easy drive away. As if that isn't enough, Saint-Rémy-de-Provence, Les Baux, Nîmes, the Pont du Gard, the Camargue, and beaches at Cassis and les Saintes Maries de la Mer are also within easy driving distance. "La Garance" is easily accessible by air (Marseille airport is a 55 minute drive away) and by train, 2 3/4 hours by TGV from Paris to Avignon (a 40 minute drive to the house). A car is extremely useful to have, but the village of Les Beaumettes is about 1.5 km away (restaurant and very small market on Thursday mornings). The larger towns of Gordes and Coustellet have many more services (supermarkets, post office, gas stations, shops restaurants...), and each is about 5-6 km away. There is a train station at Cavaillon 15kms away and there is a bus stop with service to and from Cavaillon at Les Beaumettes. From La Garance the full Calavon valley network of cycling paths is easily accessible. 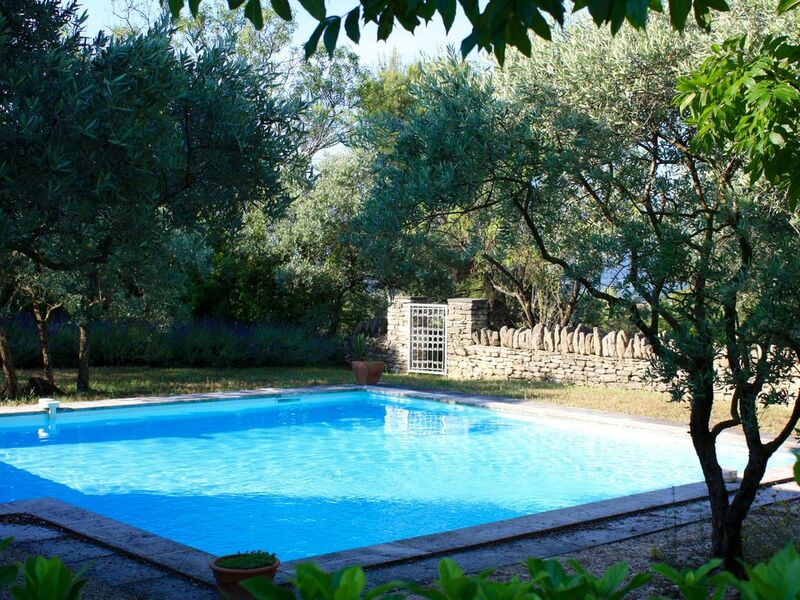 The entire house and 3-acre garden, with 17 olive trees, is exclusively accessible to guests. Privacy guaranteed. There are two steps up from the parking area at the entrance to the main door, but otherwise the house is wheelchair accessible. Complimentary once a week house cleaning for stays longer than one week. My family and I spent 2 nights at this wonderful house and loved it! Having rented in excess of 40 houses/apartments over the years, we recognize a great place when we find it. We were very sorry to not have found La Garance earlier, as we spent 2 weeks in the area in May, and regret not having stayed in this property. It is a lovely home, perfectly decorated and stocked with everything one needs to make your stay perfect. As holiday rentals go, this one will stand out as one of the best, and we hope to return next year for a much longer stay. It is perfectly situated to allow exploration of Provence, and perfectly appointed for just enjoying the pool and the house itself. We (family of 5) spent 2 weeks in this beautiful and very comfortable house. Excellent location, close to many places/ villages to visit. Lovely home, 3 bedrooms included a big parental suite with a bathroom. Big kitchen with dining room and huge living room. Each room is very well decorated. Very nice pool and shaded terrace with a big table for at least 6 people. Kids enjoyed the pool and the garden. Simone who takes care of the house is wonderful. If you have any issue, just call her and she will do her best to solve it quickly, she is very nice!!! It was very easy to communicate with the owner. Everything was perfect, we hope to return soon. We have been renting properties in the Provence region for over 20 years and our stay at La Garance was one of the very best. The house is well situated in the beautiful Luberon Valley; private, pastoral and yet close to nieghboring villages and interesting sites. The house itself is immaculately maintained, and has every possible amenity needed for an enjoyable stay. The owner and caretakers are the best I have encountered; with excellent communication and follow up. We had an absolutley wonderful stay, and we intend to visit again. We had a wonderful time at La Garance this September and agree with the comments made by the prior authors. The house is in an central location for exploring the area, close to many of the famous hilltop villages and the town of Coustellet for provisions. It felt very much like a home as soon as we arrived and is well equipped with everything you might need, especially in the kitchen. Having UK Freeview TV channels in the spacious living room was a nice bonus. We made full use of the excellent sized pool every day. The garden is not overlooked and very peaceful with only the sound of the cicadas and the odd pigeon for company. We really didn’t want to leave and would highly recommend. Every day of our 9 days in Provence it was lovely to come home to La Garance. This home is truly a home - pretty, comfortably elegant and organized. Everything is in working order and there are good books to read and an excellent selection of music to listen to. It lived up to our expectations in every way. La Garance is close to amenities and the beautiful village of Gordes where we ate many a meal. When we cooked our dinner at home we bought our food at local markets and shops. We have recommended La Garance to friends and plan to return there ourselves. We (two couples) stayed at La Garance for two weeks in late April, 2012. We loved it. The house was charming and beautifully appointed - - comfortable furnishings, lots of books (many in English) and interesting works of art on the walls. The bedrooms are at opposite ends of the house affording maximum privacy. The kitchen had everything we needed. Relaxing (and eating!) on the patio was a joy. La Garance is in a perfect location for making day trips to numerous and varied sights. The area abounds in Roman ruins, medieval hill towns, secluded monasteries, vast agricultural valleys (with numerous wineries), wild hills and deep river gorges. Towns, large and small, in the area have wonderful markets and excellent restaurants. We all thoroughly enjoyed our stay at La Garance and would not hesitate to go back another time.